The kids are beginning to get out of school and the smell of summer is right around the corner. As we invite the joys of summer we also welcome our series for this month. 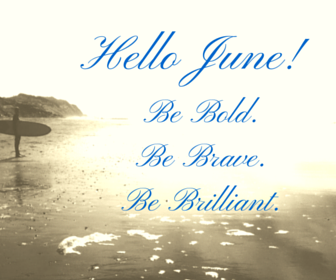 Our June series is entitled Be Bold. Be Brave. Be Brilliant. In this series we will talk about how being brave can help you live the life you always dreamed of. We will discuss what it takes to be bold and let go of anything that weigh you down. And last but not least will talk about the importance of recognizing your brilliance and using it to create the life you desire.